Aerolux made these decorative light bulbs from the 1930s-1970s. 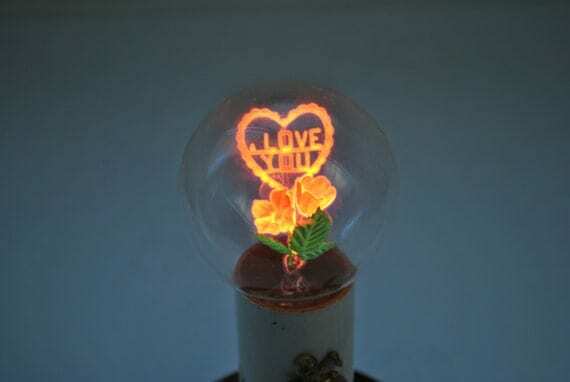 Inside the glass bulb the filaments were shaped into delicate metal flowers and messages that lit up brightly when powered. The effect is really amazing and unique! The structures inside are created using phosphorus coatings on tiny metal sculptures, that way they’d fluoresce when powered and give off the magical colored light. Understandably not many of these bulbs have lasted the test of time- the flowers inside could not be shaken or handled as the phosphorus coating would easily come off. I haven’t managed to find one of my own yet but I sure hope to! It would make such an interesting light fixture. Hello, Do you know the value of these bulbs? Specifically, the tube bulb with the rose inside? Thanks! I haven’t seen many for sale. The few intact/with boxes seemed to go from anywhere to $45-150 but I think you’re better off just googling for the pricing. Have a great day – Robert.